That is a pretty solid run! Having a chat with Mick from carry trainer earlier. He Told me to Not be afraid of losing to anyone- even myself. Solid thought process there I think. I usually shot low 5s but it feels great to finally break into the 4s. I still have a lot of work to do to make this repeatable. Very nice! Your reload and splits on the circle are on point. I look for getting around a 1.5-1.6 draw to first shot (with consistency) and a .4 to .5 split. Ultimately trying for 2.0 to 2.1 for the head shots. That’s where I would concentrate to make up time. It will help make your performance repeatable and it will allow you that .33 vs .23 split on the back end. From concealment @7 My personal best. Had my big fat finger in the frame. Last edited by SC_Dave; 02-05-2019 at 06:36 AM. Managed to cut my personal best down a little more. I'm enjoying running this drill right now. Last edited by SC_Dave; 02-10-2019 at 04:38 PM. I've started focusing the FAST drill this month after signing up for an LTT class scheduled for later this year. Currently I only have holster draw authorization for my range with an open carry/duty holster; is there a recommended type to work with? I know ALS/SERPA adds .5 sec to your final score, so I'm looking at an SLS setup for my Elite LTT for the sake of keeping things simple, assuming it doesn't add any penalty. My current splits aren't great and I keep fudging the DA shot on the 3x5. When I can run it clean, I'm generally in the 6.5-7 sec range, though I can't be sure without a shot timer. If I did a FAST drill tutorial on how to get to sub 5 seconds, would you guys dig it? Ernest Langdon already gave me his blessing. 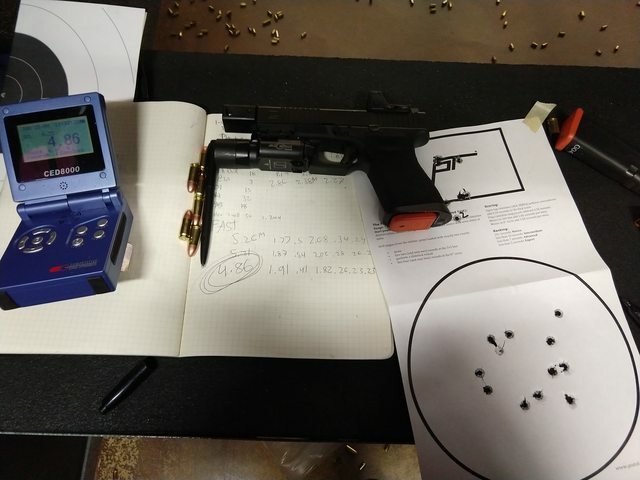 What say you Pistol Forum? I always find its my reload that gets me. If I bobble even a smidge on either clearing it from concealment or insertion, I’m not making time. I need to work my reloads more. I know. Definetly will cover that. Reps without technique refinement is a waste of time. Speed is the economy of motion.